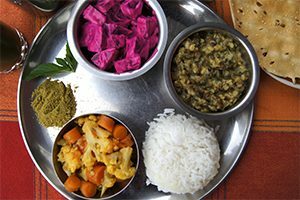 Learn to cook delicious, easy, healthy, Indian, vegetarian* recipes from all over India at a Montreal location. Slurrrrp! Welcome to hands-on cooking in a culture-rich, friendly ambience. Miaaaam! 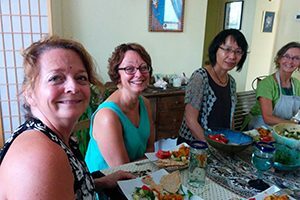 Classes in French, English or bilangue. Join the mailing list! Want to cook Indian but don’t know where to start? Wondering if healthy Indian exists, less oil & chilli; less sweet desserts, with no compromise on yumminess? 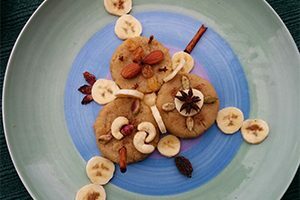 Looking for a unique gift (Indian cooking lesson!) or to celebrate an occasion by cooking Indian? My name is Veena. I was born into a vegetarian tradition in India. My mission: make it easy & enjoyable for people to cook Indian food using veggies, lentils, beans, nuts, other plant-based ingredients & SPICES! Vegetarian does not mean missing out on Butter Chicken, Vindaloo, etc. I will teach you the gravy & then you can add meat or veggies. There’s even a vegan version of Butter Chicken gravy! Indian cuisine is flexible. Regular classes at my transit friendly, pet-free apartment & elsewhere. Plus I can bring the class to your home, office, community space, in fact anywhere with a kitchen. Check out the options. Its fun cooking with friends, family, co-workers. Many gluten-free & special diet options given the amazing variety of Indian cuisine. You can book a private class too. Not just an intro. to Indian cooking, but also a rendez-vous with Indian culture. I am a writer: I love telling stories & introducing cultural elements. After we have cooked, tasting spices, inhaling aromas, admiring the colours, we will have a meal together & chat, with Indian music playing in the background. Get in touch by e-mail! Or call me at 514-839-8264.